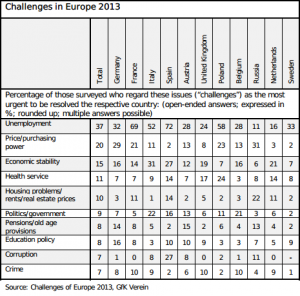 A recent survey, carried out across 12 European countries by the non-profit market research group GfK Verein, has revealed that unemployment represents the greatest dilemma in Europe. Interviewees were asked the open question, “In your opinion, what are the most important issues that need be resolved in [relevant country] today?”. The answers were not limited, and the majority of those asked named two problems on average, but Germans mentioned an average of 2.5, making them the biggest worriers. On the other hand, the Swedes and the Irish replied with an average of 1.2, distinguishing themselves as the most ‘carefree’ countries. The subject of unemployment was the most cited by respondents in Spain (72%), closely followed by France (69%), then Poland (58%), Italy (52%) and Germany (32%). Unemployment on average is a major concern for 37% of people polled overall. After unemployment, the top ten most pressing matters were inflation, economic stability, the health system, rents & housing, governance, pensions, education, corruption and crime. Trending away from the other countries, the Dutch identified economic stability as needing urgent resolution, while the Russians had the most to say about inflation. Inflation, the second biggest recorded worry overall, was less of an issue for France and Belgium, whose problem-percentage dropped 13 and 9 points respectively. 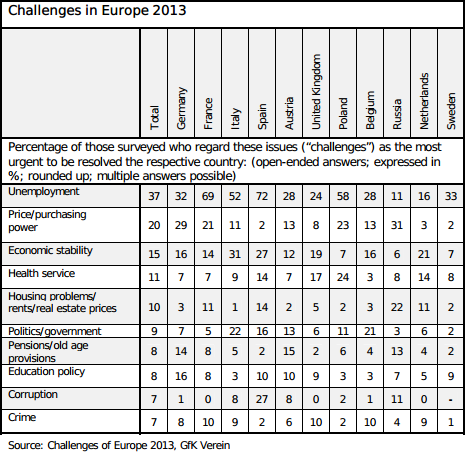 Climate change or security issues such as terrorism did not make it into the top ‘Challenges of Europe 2013’. However, Spain’s increasing frustration over the scandal involving the country’s government caused corruption to feature for the first time. A total of 13,000 responses were gathered from people in Austria, Belgium, Britain, France, Germany, Italy, the Netherlands, Poland, Russia, Spain, Sweden, and Ireland, who were questioned for the first time. Ireland’s biggest preoccupation was the labour market, with a quarter of respondents urging the development of employment and 20% expressing concern about the number of jobless in the country. Figures published by the OECD (Organisation for Economic Co-operation and Development) make this no surprise, disclosing that the unemployment rate in Ireland more than tripled between 2005 and 2012 and is currently at 14.2 percent. Although Germany was labelled the biggest worrier this year, the survey showed that only just under a third of Germans are worried, which is two percentage points lower than last year and the lowest recorded since the survey began in 1990. Moreover, the Head of Studies at GfK Verein, Ronald Frank, claims the results “reflect the good situation on the labour market”. Nonetheless, the evidence is clear that unemployment outweighs any other problem across Europe in significance and continues to represent a large part of European concern.